The archive plays the role of both an administrative archive (the storage of official documents that are no longer needed) and a museum archive. Within the framework of the museum’s mission statement, the museum archive stores exhibition and research-relevant historical text, image, video and sound documents. It defines itself as the leading special archive for personal, location and remembrance history of the research stations in Peenemünde, located on the authentic site. As well as the long-term storage of archive material and the preservation and expansion of the inventory, the digital creation and provision of digital archived goods in online search tools is one of the most important tasks of the museum. The archive is an important resource for active museum work. It supplies exhibitions, helps create publications and provides external academics with research topics. 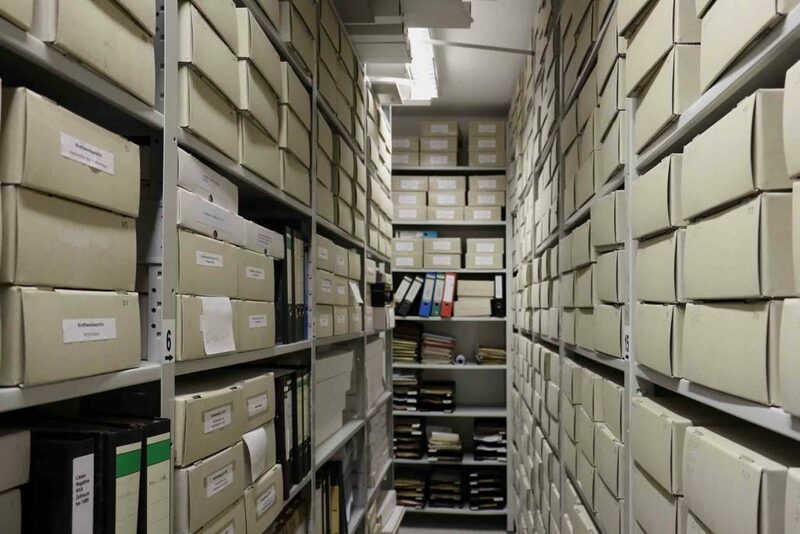 The inventory of the museum archive contains around 160 linear metres of written documents, legacies and collections as well as archived audio-visual material. It ranges from the history of the museum and the effects of the National People’s Army (NPA) in the GDR in Peenemünde to the founding phases of the Peenemünde research stations in the mid-1930s. The inventory of the museum archive is partially shown and accessible via different search tools (search books, catalogues, directories). The registry and administration data is logged electronically and can be researched with different use bases. Online research is currently not possible. The archived material in Peenemünde from the time up to 1945 has suffered significant loss due to the effects of the war. This has affected personnel documents especially from the army research facility in Peenemünde. Personnel documents of the Wehrmacht are also managed by the military archive of the Federal Archives (BA-MA) in Freiburg, the German Office (WASt) for Notification of Relatives of the Fallen from the Former German Wehrmacht, the Krankenbuchlager (sickness book archive) and for the relatives of the Waffen SS, Department R (Reich) of the Federal Archives.